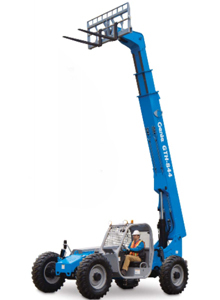 Heavy-duty workhorse for lifting applications in construction, landscaping and agriculture. Ideal for loading/unloading and moving/placing materials, as well as jobsite cleanup. Low-end torque, four-wheel drive and four-wheel steering for hills and rough terrain. Simple no-tool access to daily inspection points.